I always finish at the end of my blog posts with the words “Welcome to my world of moisture”. A simple thing happened in my world of moisture that would have most people guessing “what’s gone on here?” or maybe “who’s done this?” That thing was a pool of clear liquid around a candle holder, shown in the picture, which was sitting on a glass table. Where had this liquid come from? Who had split water or something on the table? Nothing had been split. The candle holder had been left untouched for weeks. Magically this liquid had appeared out of thin air! A mystical apparition materialising from the ether? Help, somebody call a medium. A “sign from above” warning of looming storms and flooding. Or maybe we can find an answer from science…..
Where did this candle holder come from and is there anything special about it? Well, last Christmas we were given a present of a pair of candle holders. These candle holders are heavy and made of what feels like solid rock. Actually they are solid salt and with a tea light burning inside are supposed to give off soothing vapours. When lit they are quite attractive as the candle light glows though the crystal salt. Over the remaining dark winter evenings this pair of candles holders were used most nights along with the ten million other tea light holders we have in our possession. As the nights got shorter going into spring, most of the tea light holders were stored away but the two “mystical” rock ones were left sitting unused on a glass table. One day about 3 weeks ago we were moving some furniture around and came to the glass table with the rock candle holders. They were both surrounded by a clear liquid. It took several sheets of kitchen roll to mop up this little pool. A quick sniff test showed the liquid as odourless, so our cat was ruled out as a possible culprit. During the mopping up I was running possible explanations through my mind and soon put together “salt” and “liquid”. Could this be a salt thing called “deliquescence”? What a great word “deliquescence”, it sounds like a faddy place to go and eat something a bit delicious. In science, it’s a physical property of solid salts where they adsorb moisture from the air and start to dissolve in the adsorbed water. This dissolving of the salt can continue until the entire solid salt becomes a concentrated salt solution. But this can only be part of the explanation. How is it we had these candles holders for half the winter and into spring and not seen the liquid until now? 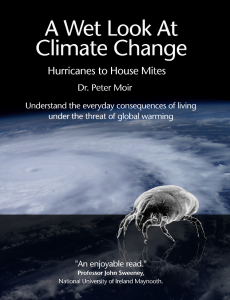 In my eBook A Wet Look At Climate Change I dedicated a whole chapter to Salts. At the time of writing my book I saw salts as having a special relationship with moisture in the air. My thinking now is that salts are just like most materials which constantly interact with the water molecules flying around us all the time. We call this flying around of water “humidity”. Other materials around us would show deliquescence if it wasn’t for their chemical structure holding them together and not allowing them to easily dissolve. So in a mental experiment in my mind I’m bringing together salt, liquid, deliquescence and humidity. The one part in this mental experiment that has changed from winter to summer is the humidity. the outside humidity is high that usually causes a build of humidity inside the house. Especially in summer when the doors and windows are open, this lets in the moist air. As I type this I’ve just checked my weather station and it’s telling me that the outside humidity is 71% and the inside is 73%. It’s 1.30 in the afternoon, sunny but windy and the ground is dry. Due to evenings being cooler than daytime, the humidity will increase. Why that happens I explained in Chapter 1 of my eBook. On some damp days I’ve seen the inside daytime humidity get up to as high as 83% and nearly 90% in the evening. A final piece is needed in the candle holder puzzle to complete my mental experiment. 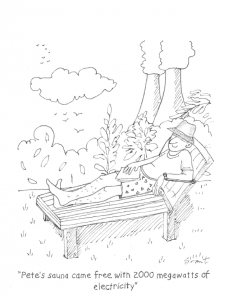 This piece can be found in Chapter 3 of “A Wet Look At Climate Change” where I talk about a phenomenon called Equilibrium Relative Humidity (ERH). This is a natural tendency for materials to adsorb and release moisture depending on the surrounding %RH. All we need to find out now is the ERH of the salt candle holders. How do we obtain this ERH? You cannot google it! You have to measure the ERH somehow. Basically at its simplest level, you take the thing you want to measure and put it into a sealed container along with a way of measuring relative humidity. There are other things that need to be taken into consideration, some precautions, but if done properly you get a fairly quick result. I did all these things and came up with an ERH value for the salt candle holder of 76%. To use this ERH value involves a bit of knowledge about Nature. Many, many materials all around us take up moisture from the air and then release it back again. All that is required is for the ERH value of the material to be below the surrounding relative humidity and without fail, moisture is adsorbed. The opposite happens when the humidity drops below the material’s ERH value. 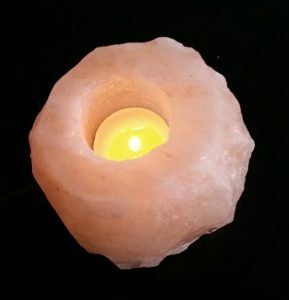 Because the salt candle holder has been kept in a room where the humidity was, a lot of the time, above its ERH, it naturally adsorbed moisture from the air. But because of deliquescence, the adsorbed moisture dissolved some of the salt and ran off the candle holder as a saturated liquid salt. As I said earlier, the outside humidity has stayed quite high this summer, so I did a little practical experiment. 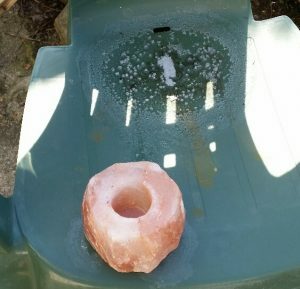 I left the salt candle holder outside on a plastic chair for a few of days when there was no rain forecast. In the photo you can see the liquid produced from running off the candle holder. The white spots at the edges are the salt recrystallizing as water then evaporates. The same effect happens at salt lakes and hot salt springs that gives the salt deposits. For this to occur with the salt candle holder the outside humidity would have to be above 76%. If the Earth’s climate is getting warmer and wetter with much more moisture moving around, I’m convinced that this must have consequences. We as humans have developed materials and technologies within an environment that has fluctuated around “average” humidity levels. Into the future expectations of climate change, what then happens in our world if the “average” humidity goes up say 10%? My guess is that dissolving candle holders will be the very least of our worries! If you would like to hear more about moisture and humidity in everyday life, please sign up for email alerts of my blogs. This entry was posted in My Moisture Technical and tagged Candle Holder, equlibrium humidity, Humidity, Moisture, Salt on September 22, 2017 by PeterMoir.